The word spa and you think of relaxation, fresh smell and soothing massage. When I was still single, I would go to the spa whenever I felt like it. As a Mum of course priorities have changed. 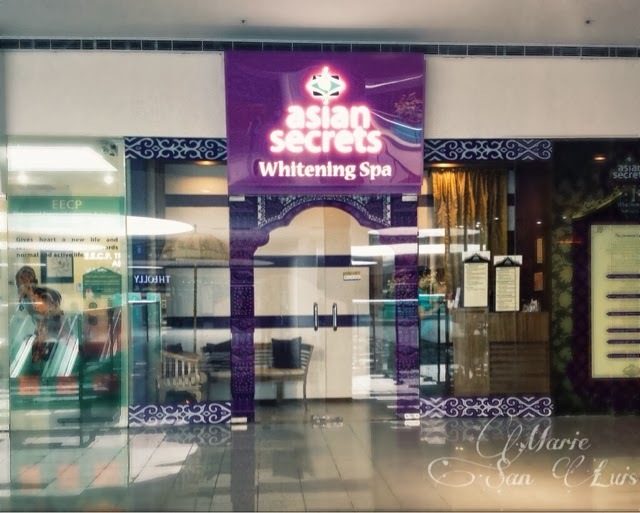 However, I was lucky enought to have won a giveaway from Mommy Practicality's blog last year and it was a gift certificate for Asian Secrets Whitening Spa. I have a schedule which is so hard to work around that I only actually got to redeem it on the last day of it being valid, I was lucky enough to be still be able to reserve a slot last Friday morning. This is one thing I suggest you do, give them a call first before going, their schedule is full most of the time and that also spurred my curiosity as to why there is such a fuss for this spa, but they also accept walk ins when a slot becomes available. Straight from a shift and after a 30 minute nap, off I went. Their spa is located on the 5th Level of The Block, my favorite mall of SM City North Edsa, I love the fact that it isn't too crowdy and it is easily accessible if you are using the MRT to get there. The waiting area, I felt was a little too small but I did love the fact that the magazine's were up-to-date and not tattered old ones. As soon as you stepped in you could already sense the tranquil vibe of the place, the interiors were simple and calming to the eye. Although I had to wait for a few minutes since the reception was relatively small, it didn't bother me too much but I would like that if they have a visible section where it says "Please fill out the form here", this would have made up for the waiting time and also put me in a queue. After filling out the form, I was called and introduced to my attendant Tina. I really have to apologize for the lack of photos. I was ushered into a room which was roomy enough and was informed of the type of service I would be getting. My GC was good for a Whitening Facial and massage for 60 minutes worth Php480 called the Purity Facial, which uses a "gentle Lulur facial exfoliation, followed by the removal of comedones that clog the pores, and a brightening ritual that beautifully gives softer and glowing skin" and I also got a facial, neck with shoulders massage. I was asked politely by Tina if I would be comfortable to remove my top and since I agreed I was handed a cover up then she exited to room for me to get ready. The manners of the attendants was something I really appreciated since I was feeling a little tired ang grumpy from no sleep, Tina spoke in a low relaxing tone and with a smile. I do recall of having a horrific experience once while getting a pregnancy massage in a Marikina Spa where attendents were talking loudly and playing music on the mobiles (heaven forbid!) so I felt so relieved that this was totally the opposite. A few minutes after, Tina asked if I was ready before entering and prepped me for the facial. Everything smelled and felt good on my face, and I could feel the exfoliation and how my face felt lighter and smoother. The massage kept me in a relaxed state, it wasn't the regular mash mash massage, it was more concentrated on using her fingertips and I knew my face needed something like this for so long. 60 mins was just right for me. 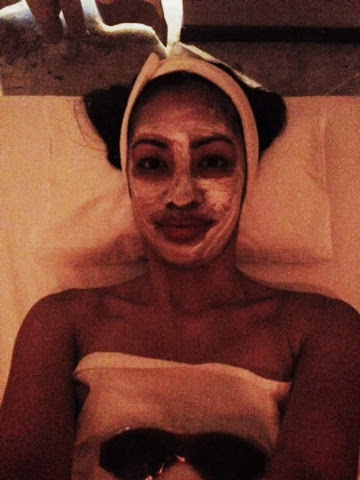 I think my favorite part was when Tina placed a warm towel over my face to open my pores then she covered my face with a facial mask and left me for a good 10 mins (super heaven) for the face! Hope that didn't scare you! Hehe. Oh, that on my chest is a gel eye mask. Pretty cool for those peepers with bags, which I placed back on my eyes after the photo. I had to take a photo of this, totally want one of these in my bedroom! Their facilities also include showers and a toilet with complete toiletries available to use. For the price to pay at Asian Secrets Whitening Spa, it's thumbs up for me, I am really looking forward to try their other services like their Pearl White Licorice Body Scrub and their Asian Secrets Signature Whitening Massage. Their other services are Fair Skin Body Wrap packages and Royal Foot Spa. I am praying that they open a branch within Cubao or Eastwood soon. An extraordinarily BIG kudos and thank you to Tina (my assigned attendant) and to Jenny, the very accommodating receptionist. I've been hearing a lot about Asian Secrets, but never got around to trying it out. Ang layo eh! I wish they open a branch in Eastwood! We can only dream Kim for an Eastwood Branch, but let's do hope they hear our plea :) Super effort cya puntahan pero worth it naman hehe. Thanks!